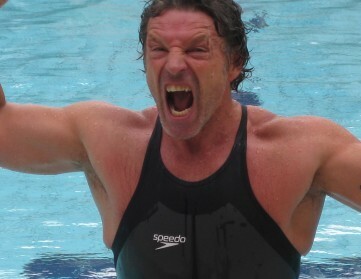 I have been a Masters swimmer for more than 15 years. I have joined workouts all over the world. I have interacted with all kinds of adult swimmers. The one common thread, the very thing I have witnessed time and again, is lane rage. Swimmers unfamiliar with the etiquette of the pool frustrate those that have more knowledge of how to keep a proper flow. To be fair, though, I often see seasoned swimmers breaking cardinal rules rendering them pool pariahs. In an effort to allay tension and confusion, I have compiled a list of Do’s and Dont’s for those swimming in a Masters setting. Be on time. I am appalled by the number of people that regularly show up late for scheduled workouts. Groups stroll in 10 minutes late like they are taking a class on a cruise ship. It is unfair to lane mates and disrespectful to the coach. Please, be on time. Place yourself in an appropriate lane. If you are in a lane that is too fast, move down a lane and lead. It is a much better workout to go first than to sit on the wall gasping for air. Learn how to use the clock. Really? I am baffled that people cannot read the clock, even after years of swimming. If you are doing 6×50 on :45 and you leave the first one on the :05, your subsequent send-off are, :50, :35, :20, :05, :50. You have the entire repeat to figure out when you leave again; it is much better than staring at the black line on the bottom of the pool. Know your times. This is a corollary to point 3. Once you learn how to use the clock, you will be able to figure out your times for all of your repeats. I cannot tell you how many times I hear a coach ask a swimmer what they did on their repeats and after counting on their fingers and toes they still have no idea, or they just say, “I did what she did”. It is important to know your times so you can gauge your improvement and have a handle on whether you nailed the workout. Take the time to learn proper technique. This really does not apply to lane rage, but it will make you a better swimmer. Don’t leave early. If the lane is going 5 seconds apart, do not leave 3 seconds back. In no time at all, you will be on the feet of the swimmer in front, and that is annoying. Don’t use your equipment unless the set calls for it. Triathletes notoriously love their pull buoy. In fact, there are some people that need it surgically removed. It is a crutch. Learn how to swim without it. And, don’t give the excuse that you only swim with a wetsuit, so it is ok. At today’s swim workout, Dave Scott yelled at a repeat offender to lose the buoy, and then he threw it out of reach. Don’t turn around early. I see people stop at the flags, touch the bottom, and turn around. What is this? If you turn around early in a race you will be DQ-ed, so don’t do it in a workout. I will offer these stipulations: if your paddle comes off because you hit another swimmer or if you took a big gulp of water and need to catch your breath, it is acceptable to turn around to get back to your spot in the rotation. Don’t jump in front of another swimmer if you sit out a 50. It’s distracting. Don’t mess up the intervals. See point 3 in the Do section. Don’t spread germs. If you are sick, stay home or swim alone. Don’t wear a peek-a-boo swim suit. When in doubt, throw it out. Hopefully these insights will lead to a more harmonious swim workout. Have you experienced lane rage? What are you Masters swimming pet peeves? Great listing of do's and donts!!! My biggest complaints are with people who go out way too fast (acting macho) and have to then sit on the wall the next lap to recover. Also- 'splashers'… Not that I am the best or fastest swimmer, but I try and have some sort of grace or form. Arm floppers annoy me. I can't stand the spitters, and they ain't just spitting back pool water. – If you are perpetually on someone's feet it means you should be leading. – Move to the left before you reach the wall, so that you are not turning back right into the person behind you. – If you are going to sit out, get out of the way. – When you enthusiastically jump into the pool at the start of workout, don't do it right on top of someone who got there on time. – If you are always hitting or being hit/kicked, you might consider that it is you that is swimming down the middle of the lane, not everybody else. Also: Get out of the way when you finish so the next person can reach the wall for their finish/time. Kick means kick. Here, many triathletes swim and kick with Zoomers on. Not happy when a person with Zoomers on a) refuses to lead b) continues to tap my feet. These same people have body position and weak kick problems. I was working as a consultant in Peoria, IL (Caterpillar). Went to a few masters workouts and the coach had me lead one of the lanes. On the last set, (a 400 IM which I swam in NCAA Div. I) I caught the last guy in the lane at 375. Not being from that group I slowed down to allow him to continue and not interfere. He was ENRAGED by what he called "charity". "Pass me you a$$hole!" (I'll spare you the rest.) In a lane with 8 people (25 yard pool) and I had a bit of a lead on #2… I thought it was appropriate. "when in doubt, throw it out"….classic. We finally got Josh to throw his Peek-A-Boo TAN colored one out. And if I am complaining….it's bad.